I finished my federal taxes on Friday and I’m going to use part of my refund to buy a new TV. 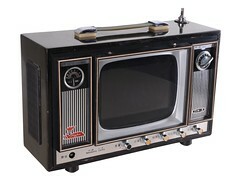 I have a 32 inch picture-tube TV that I bought ten years ago. I’ve been waiting of fit to diet before I replace it, but the damn thing just seems to want to live forever. The picture went out once about 18 months ago. But, after I turned it off and back on, it’s worked fine since then. But, I don’t know anything about the new flat screen TVs. So, I figured I’d ask for advice. A few questions come to mind, but there may be other things to consider that I’m not even aware of, so I’d appreciate any input. Any special features I need? Any specific brands or retailers you’d recommend? Thanks! Any advice would be greatly appreciated.